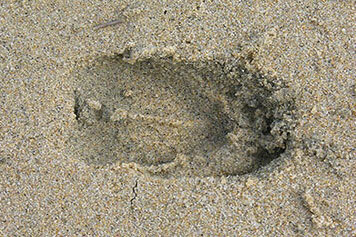 Animal tracks can often be found in wet sand and mud. 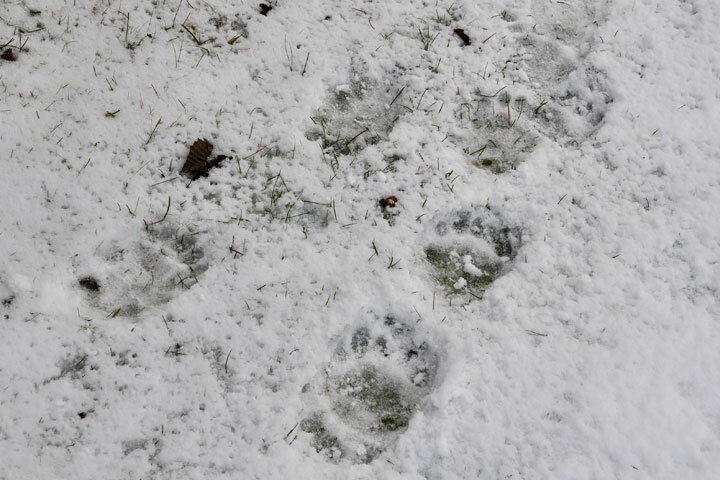 Yet, perhaps the easiest time to see a profusion of mammal tracks is late in the year—November, December—after a shallow layer of fresh snow has covered the ground and turned the world into a canvass upon which are painted a myriad of prowlings and scurryings. 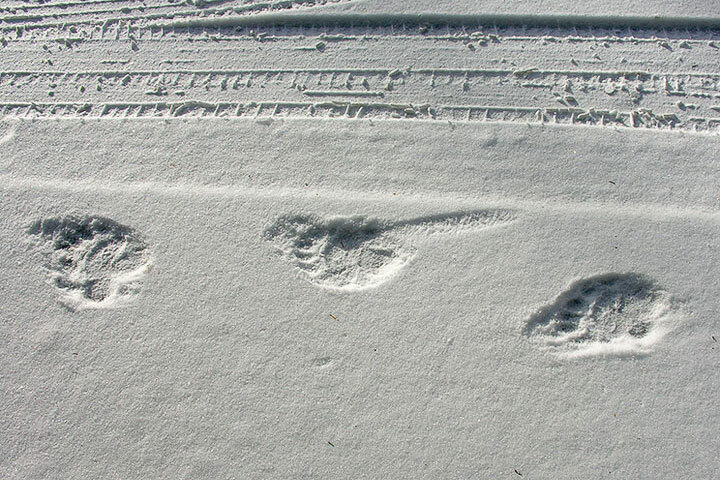 Although many animals roam at night, they don’t cover their tracks, and so allow the low winter sun of the following morning to present prints in sharp relief. It is fascinating to discover the range of usually unseen animals with which one shares the land. A black bear wandered down my driveway and past the side of my house. The foot ruler reveals the track on the left to be about 23 cm long. 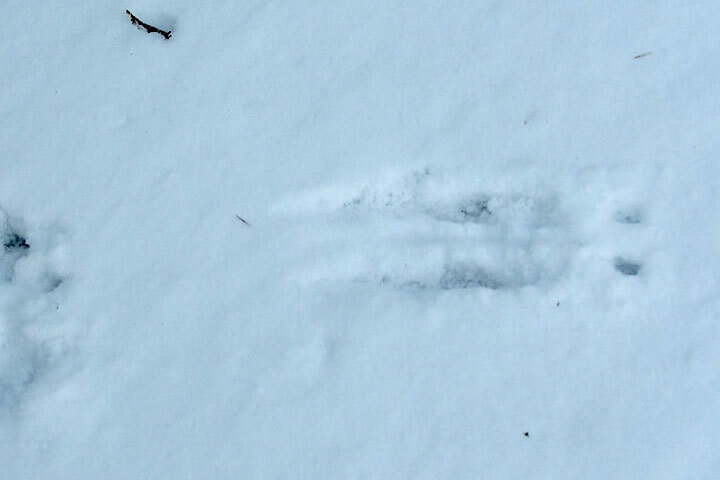 Tracks of a black bear in the shallow snow under a tree. The same black bear, as in the left–hand picture then walked toward the Lake through deeper snow. 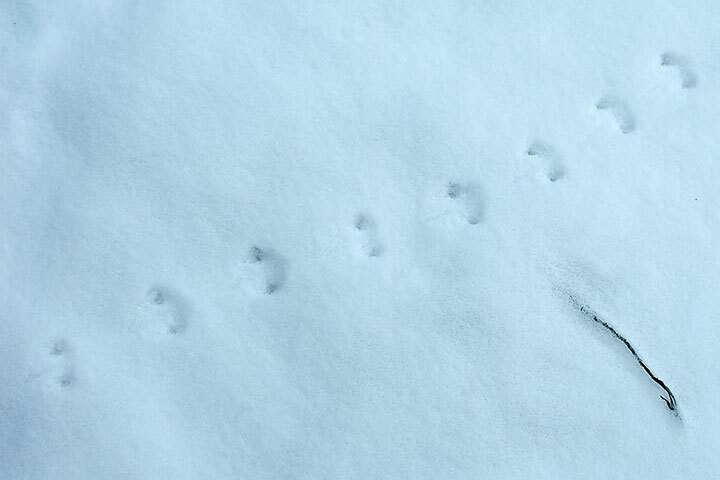 The tiny tracks of a deer mouse hopping across the snow show a thin central line where the tail touched down. 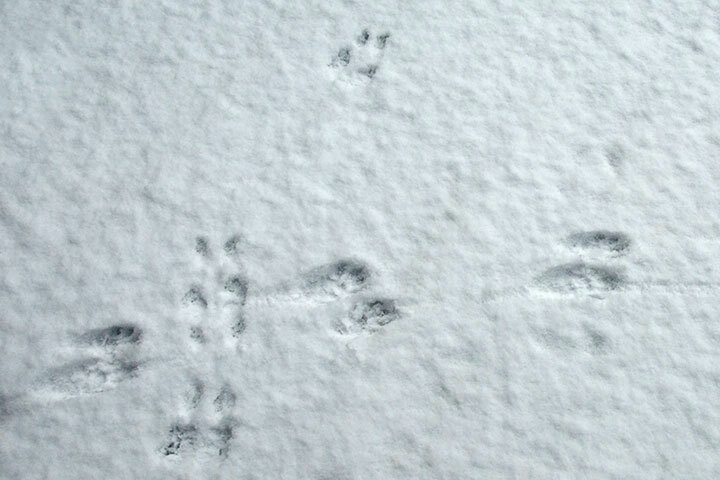 A red squirrel travelled across the snow (right to left) from one tree to the next. The squirrel is a gallop walker: its front paws hit the ground first (the two small prints on the right); its rear feet pass to either side and land in beyond them. 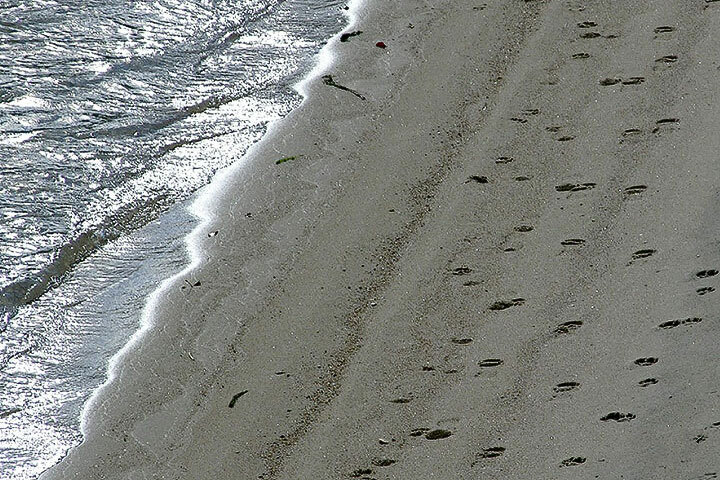 The tracks of many cloven hooves are seen as a herd of deer made its way across the beach to the water’s edge (where they have been erased by waves). Dog tracks appear in the lower left. The two small indentations to the rear of this deer track (lower left) are from its dew claws. Being slightly higher on the (back of the) foot, these usually only show up when the imprint is deep. Sometimes one can learn an amazing amount about an animal from its track. 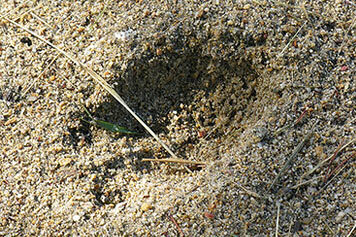 This double hoof print in wet sand is from a deer travelling to the right. The rear hoof of a deer hits the ground in almost the same position as the front hoof, albeit slightly behind and to one side. Of the two toes, the outside one is somewhat bigger, so this is from the left side of the animal. As the rear hoof print fell slightly outside the front print, this deer has a wider pelvis than shoulder indicating that it is female: a doe. 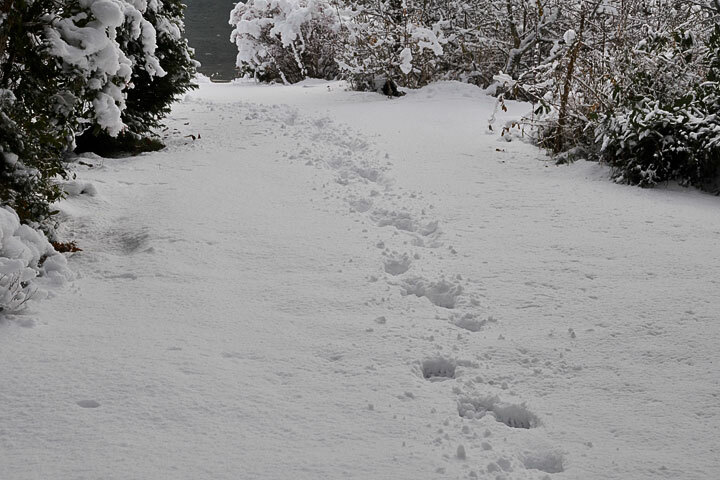 The deer walked across shallow snow from right to left, and dragged its hooves. 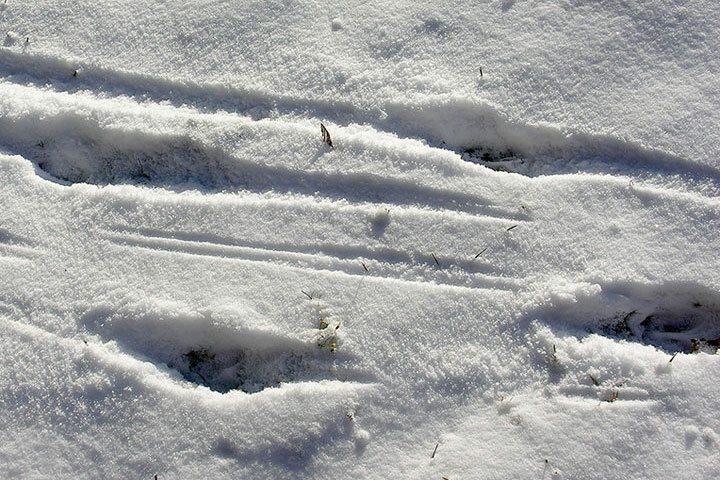 It may well be a buck (male), which are more likely to drag their front legs owing to the considerable weight of their antlers, but does (females) are known to leave such tracks also. Around midnight, a raccoon travelled from left to right, then after sunrise the next morning, a red squirrel crossed its path travelling from middle top to bottom left. It was bounding (hind paws in front of forepaws, but when it came to the raccoon track it paused briefly.